Wat Ananda Youth (WAY) was formerly known as the Ananda Metyarama Buddhist Youth Circle. We organise activities for the Buddhist youth and also, for those who are keen to learn about Buddhism. In 2006, on its 40th Anniversary, AMBYC decided to reinvent itself to appeal to the youth of the 21st century. We revisited our objectives and programmes and decided to change our name from AMBYC to Wat Ananda Youth (WAY), a catchy name which is easy to remember and reflects our roles and vision. WAY continues to hold most of its activities in Wat Ananda Metyarama Buddhist Thai Temple. The Buddhist youth group continues to maintain a symbiotic relationship with the Thai temple which has been established since 1966. To propagate the dhamma through spiritual friendship and practice-focused interest groups. The footprint symbolizes the “Buddha’s Path”. The letter “Y” blend in nicely with the footprint graphic, depicting the “WAY” concept. The FIVE colours are used to depict Buddhism. The logo as a whole has a lively feel which epitomizes the energy and vibrancy of the youth. To know more about the individual pillars, please refer to the menu items. WAY was formerly known as the Ananda Metyarama Buddhist Youth Circle (AMBYC). 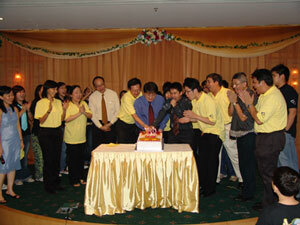 It was born on 23 November 1966 and was the first Buddhist Youth Circle in Singapore. Maha Somkuan Aggadhamma (Phraku Bisaldhammanides) became the first Spiritual Advisor. On 28 November 1966, His Excellency, Mr Payong Chutikul the Royal Thai Ambassador officially declared the opening of AMBYC. 30 years since its inception, AMBYC is proud to record many memorable events and contributions to Buddhism and preserving the Thai Theravada Tradition in Singapore. In 1996, we introduced a New Logo to create a new look which stresses the importance of the Learning, Practising and Sharing of the Buddha’s Teaching. To study, practise and propagate the Dhamma. To train the youth for, and encourage them in acts of, charity and general helpfulness to their fellow beings. To educate the youth to become better members towards society. To foster co-operation among Buddhist Youth and fellow beings. To participate in healthy recreations.